Federal biologists on Friday sent their strongest signal to date that the Columbia River Basin's immense hatchery production -- and the lucrative fishing opportunities that result from it -- could be reduced to better protect wild salmon and steelhead runs. The draft report, the most thorough evaluation to date of the damage from hatchery fish, rounds up years of study of 178 hatchery programs feeding the Columbia, Willamette and Snake rivers. The millions of fish generated at those hatcheries each year eventually provide three-quarters or more of the salmon and steelhead returning from the ocean. The hatcheries range from concrete basins to more modern versions that try to simulate sinuous spawning grounds. The National Marine Fisheries Service looked at four alternatives to the hatchery status quo. The toughest option: eliminating federal funding for hatcheries under the Mitchell Act. That would cut total hatchery production from 144 million fish a year to 52 million, reduce the number of hatchery programs by 40 percent and cut the number of Columbia Basin salmon and steelhead harvested by half, from roughly 600,000 annually to 300,000. Other alternatives would maintain federal hatcheries and funding but increase operation standards. Those alternatives would reduce the total harvest by tribes and commercial and sport fisherman by up to 120,000 fish, the service estimates. 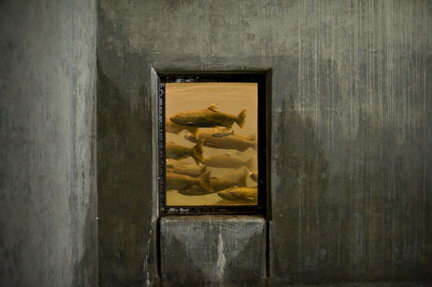 Hatcheries were established to boost harvests a century ago, and were built in force after the federal government erected fish-killing dams across the basin. They're designed to help compensate for the fish lost to dams, urban sprawl, agriculture and a host of other threats, including the spread of non-native sportfish. But the hatchery fish also compete with wild fish -- including 13 runs of wild Columbia Basin salmon and steelhead listed under the Endangered Species Act -- for food and spawning grounds, driving down their numbers. When finalized, the environmental impact statement will guide NMFS' distribution of federal Mitchell Act dollars to the basin's hatcheries, ranging from $11 million to $16 million a year, and inform the service's review of individual hatcheries under the Endangered Species Act. "We're trying to recover (wild) fish while providing for all the other uses that people want," said Rob Jones, chief of NMFS' salmon recovery division. "All of us would rather see a Columbia Basin that produced enough fish to where we didn't need hatcheries. That's not the reality right now." The report highlights some environmental pluses from hatcheries. The sheer volume of hatchery fish adds nutrients to rivers when they return and die. They help feed killer whales and birds (and, as any fisherman west of Bonneville Dam will tell you, sea lions). In some cases, they fill in uninhabited parts of the basin. But the overall ecosystem picture is bleak. The hatchery fish interbreed with wild fish and can weaken the genetic stock. They're more subject to disease that can spread into wild runs. They take up habitat and food, and in some cases, prey on the wild fish. The model calls for the human-bred fish to return to their hatcheries, leaving natural spawning grounds to wild runs. Yet most hatchery programs "cannot control" the number of hatchery fish on spawning grounds, the report says. And in most cases, the numbers of hatchery fish on spawning grounds "is higher than what current research suggests is desirable." About half the basin's current hatchery programs would not meet the toughest standard used in the report for reduced interference with wild fish. The 178 hatchery programs operate at 80 hatcheries, more than one-third funded through the Mitchell Act. The Bonneville Power Administration and other federal agencies help pay for the rest, many operated by tribes that have fished in the basin for thousands of years. Tribal fishing revenue in the basin topped $3.4 million in 2007, NMFS said. Mike Matylewich, head of fish management for the Columbia River Inter-tribal Fish Commission, said hatchery operators are doing more to limit their impact on wild fish. But there's still a need for high hatchery production, given the fish removed by federal actions. He cautioned against moving "too far, too fast." "If it was simply about wild fish, that'd be one question," Matylewich said. "But it needs to fit into the larger social structure, and that makes things a whole lot more complicated." Early on, the thought was that hatcheries could essentially replace wild runs blocked by dams. But it's clear now that hatchery fish, not subject to the natural selection pressures of their wild counterparts, are an unfit substitute in the long run, said Glen Spain, Northwest regional director for the Pacific Coast Federation of Fishermen's Associations. "A rethinking of the whole hatchery paradigm is in process," Spain said. "It's more than 50 years late, but at least it's moving forward." Jones, of NMFS, said hatchery conditions and operating standards are "a mixed bag" in the basin, in part due to flat federal funding. But many hatcheries have made significant improvements in the last 15 years, he said, including cutting releases of hatchery fish in vulnerable areas and switching to stocks closer genetically to nearby wild fish, reducing the damage from interbreeding. "We're constantly learning," Jones said. "We're constantly getting better." Among other measures, the report suggests setting up weirs to trap and remove hatchery fish before they spawn, and closing at least 10 hatchery programs whose "strays" most affect wild fish. The draft is open for public comment through Nov. 4. After that, NMFS will pick an alternative or some combination of alternatives. Bill Bakke, executive director of the Native Fish Society, said it's too soon to say whether the priority will be recovering wild fish or "letting harvest and hatchery operations run the show." "There's always a lot of promise at the leading edge and a lot of optimism," he said. "But when it comes down to actual operations, we don't always get what we were hoping for."